I am actually running the whole event (back after 2 years of surgeries), and I need to know who the POC is for the MB, if you need tables (and how many), if you need power, and an approximate footprint size for your desired space. And the week before the event (Oct. 20th), we need a roster for your team. This is a fun event in its 14th year at the museum, run like a Trick-Or-Treat Street inside the museum. Everyone volunteering for the event gets in free, and there are more volunteer opportunities beyond the MB booth (contact me for info - PtrsonsZOO at hotmail dot com). The under 18 crew is also welcome, but only if they are actually volunteering (not a "get the whole family in free" deal). A great example of what we're looking for from the kids comes in the form of the Blackburn family, manning the Green Screen, shagging darts/balls, and helping with crafts. My clan will be back in force to help with the GSA, dart wrangling, etc. Need some details and a POC for this one. Is anyone stepping up for that? I'm not the POC, but Star and I would like to show up to help with the MB booth. Let's get a sign up going just so we know a total. Super fun troop, family friendly, hand out candy, take pictures and have fun. I'm sure there will be other areas like the craft table or games to help out with as well. Come prepared to help. This is one of the museums largest attending events and I will boast and say it's because of us, the Star Wars fans. With that being said, you don't have to wear a SW costume if you don't want to. Requested the day off for this, count me in! I can come for a few hours.. 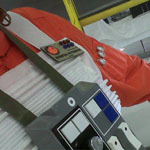 I HOPE to have my white Leia done by this weekend...at least that is the goal. No sign up list, it's all hands on deck. Please bring a bag of candy or giveaways (stickers, tattoos, pencils) if you can for the RL table. I'm only bringing one background and some table stuff, don't know where we will be set up yet and if you want to come early to help set up, that would be great. I will be there we will try to get there earlier for help setting up.